The wind pounced on the old woman huddled tightly in her sari, as she guarded her eyes against the blowing sands. It tore free the bright fabric and spun it to the skies, a mad scarlet tangle that leapt and whipped and taunted. Silently, she waited for the wind to grow bored, to spend its rage against the silk and leave her in peace. Every once in awhile I love doing an assigned glass project. It’s a good stretch of the creative muscles–they tell you what they want, and you get to figure out how to accomplish it. Good, clean brainfun. 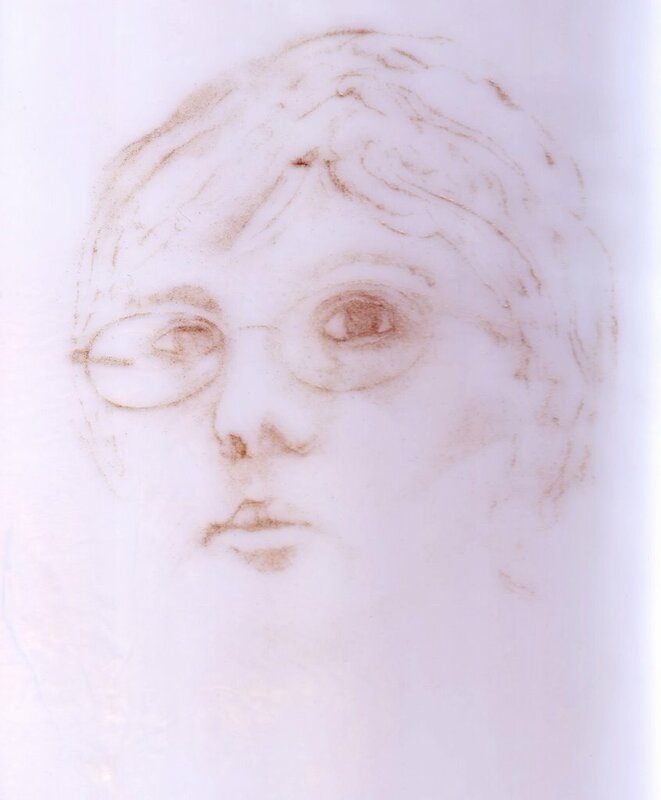 For example, Cynthia Oliver on the WarmGlass board suggested a virtual self-portrait exhibit. I’d never done a self-portrait before, except by accident, and figuring out how to represent myself was a challenge. I went through probably four icky solutions to that problem, each more elaborate than the last. Then I decided to stop making things so hard and just sketch, and all of a sudden I was there. That assignment taught me more about the difference between real and fancy for the sake of fancy than I would have picked up in months or years on my own. So when the WarmGlass folks (this time Toni Johnson) came up with another idea–a glass “quilt,” I joined the 60 or so artists who volunteered. The theme: Earth, Air, Fire, Water. We were to pick one or more of the four and illustrate them on an 8×8 inch tile. When everyone was done, we’d assemble the quilt on a wall. Now, glass is forever being compared to water and it’s produced in fire. I figured that many of the 60-odd artists would choose to portray those. A few more would get the granular frit thing going and go for earth. But the hard one would be air, so that’s the one I picked. Still, air’s kind of hard to represent since it’s invisible (or supposed to be–at one point I thought about just sprinkling grey frit on a clear glass tile and calling it “smog”). It seemed that wind would be the better bet, and about that time I came upon a picture from the Corbis archives, of several women in saris, huddled together against the wall of a village hut while the winds tore at their clothes. If I isolated one woman and exaggerated the wind effect it seemed like I’d have a pretty good representation of “air.” The more I thought about it, the more real this woman grew, and the whole idea of an old woman patiently waiting for capricious Air to spend itself and move on really started to get to me. I didn’t want to spend much time overthinking this one–it needed to be spontaneous–so I quickly threw some gestures into porcelain clay and designed the tile. Kinda escaped reality (any woman wearing that much cloth would need a wheelbarrow to carry it), but in the end I depicted a woman’s sari, lofted high by the wind. I purposely kept the face concealed, and as abstract as possible–I want the eye to follow the sari around the tile and only then find the face, and the hand desperately clutching her remaining cover. I built a little “ground” for her to stand on, and then went kinda crazy with the folds of the cloth (that was fun). This is a classic pate de verre process to make a bas-relief tile. I invested the clay with my current favorite, Ransom & Randolph R&R910, and then spent about four hours picking bits of clay out of all those nasty little creases in the mold (the folds of cloth). When I finally got them out and the mold cleaned up, I started packing it. For those of you into kiln casting, this is all Bullseye glass. I chose my favorite Pimento Red powder (a luscious vermilion) with backing of BE Red (transparent) in the deepest part. The face is a combination of BE Woodland Brown, Sienna and Crystal Clear powder, as is the hand. Her boots are leftover face powder with a healthy dose of Medium Amber and more Sienna. The background, which appears translucent, is actually BE Crystal Clear (mostly). The millions of tiny bubbles surrounding the grains of glass powder give it a translucent look. I kept the transparency to some extent by filling the last half inch of the mold (which became the very back of the piece) with medium Crystal Clear frit. The “ground” under her feet is mixed with Olive Smoke powder and some Pimento Red to give it some weight. The “air” around the sari is swirled with lashings of Powder Blue and Translucent White powder. You can’t see them, really, but they add some depth and movement. I packed the vertical sides of the red and brown areas using carboxymethylcellulose paste (often used in the food and cosmetics industries to add thickness) mixed with the glass powder. Otherwise, this is a completely dry pack, no chance of scum. At its thickest (around her skirt) Windwoman is about 2.5 inches deep, and at her thinnest (some of the background tile) she’s only 1/4 inch. That’s a huge thickness variability, especially in such a small tile, so this was a looooooong, sloooooooow firing with a very conservative annealing schedule. Only one thing really bothered me about the piece out of the kiln–the R&R910 was harder to remove from the glass than it should have been. In fact, it left tiny grains of sand in the glass. They were easy enough to scrape off, but a pain. I’ll most likely sandblast this lightly, and send it back for acid polishing, just to get the surface a bit cleaner. I’m told by Hugh “glassburl” on WarmGlass that I’m adding too much water to the investment, so my next piece will be more conservative. We’ll see where that goes. I’m reasonably happy with the way it turned out, and I’ve sent off the images to Toni, so we’ll see where this goes. It’s not a masterpiece, but it was an interesting exercise and I enjoyed it.